A will or testament is a legal document by which a person, the testator, expresses their wishes as to how their property is to be distributed at death, and names one or more persons, the executor, to manage the estate until its final distribution. For the devolution of property not disposed of by will, see inheritance and intestacy. Throughout most of the world, disposal of an estate has been a matter of social custom. According to Plutarch, the written will was invented by Solon. Originally, it was a device intended solely for men who died without an heir. Some jurisdictions recognize a holographic will, made out entirely in the testator's own hand, or in some modern formulations, with material provisions in the testator's hand. The distinctive feature of a holographic will is less that it is handwritten by the testator, and often that it need not be witnessed. In Louisiana this type of testament is called an Olographic or Mystic will. It must be entirely written, dated, and signed in the handwriting of the testator. Although the date may appear anywhere in the testament, the testator must sign the testament at the end of the testament. Any additions or corrections must also be entirely hand written to have effect. In England, the formalities of wills are relaxed for soldiers who express their wishes on active service; any such will is known as a serviceman's will. A minority of jurisdictions even recognize the validity of nuncupative wills (oral wills), particularly for military personnel or merchant sailors. However, there are often constraints on the disposition of property if such an oral will is used. Testator - person who executes or signs a will; that is, the person whose will it is. The antiquated English term of Testatrix was used to refer to a female. Trustee - a person who has the duty under a will trust to ensure that the rights of the beneficiaries are upheld. The testator may demonstrate that he or she has the capacity to dispose of their property ("sound mind"), and does so freely and willingly. The testator must sign and date the will, usually in the presence of at least two disinterested witnesses (persons who are not beneficiaries). There may be extra witnesses, these are called "supernumerary" witnesses, if there is a question as to an interested-party conflict. Some jurisdictions, notably Pennsylvania, have long abolished any requirement for witnesses. In the United States, Louisiana requires both attestation by two witnesses as well as notarization by a notary public. Holographic wills generally require no witnesses to be valid, but depending on the jurisdiction may need to be proved later as to the authenticity of the testator's signature. There is no legal requirement that a will be drawn up by a lawyer, although there are pitfalls into which home-made wills can fall. The person who makes a will is not available to explain him or herself, or to correct any technical deficiency or error in expression, when it comes into effect on that person's death, and so there is little room for mistake. A common error, for example, in the execution of home-made wills in England is to use a beneficiary (typically a spouse or other close family members) as a witness—which may have the effect in law of disinheriting the witness regardless of the provisions of the will. 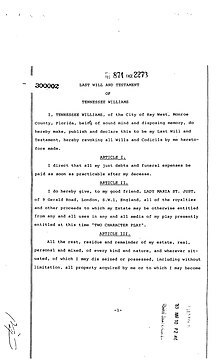 A will may not include a requirement that an heir commit an illegal, immoral, or other act against public policy as a condition of receipt. In community property jurisdictions, a will cannot be used to disinherit a surviving spouse, who is entitled to at least a portion of the testator's estate. In the United States, children may be disinherited by a parent's will, except in Louisiana, where a minimum share is guaranteed to surviving children except in specifically enumerated circumstances. Many civil law countries follow a similar rule. 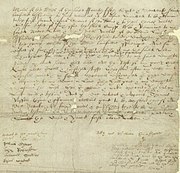 In England and Wales from 1933 to 1975, a will could disinherit a spouse; however, since the Inheritance (Provision for Family and Dependants) Act 1975 such an attempt can be defeated by a court order if it leaves the surviving spouse (or other entitled dependent) without "reasonable financial provision". In 1973 an international convention, the Convention providing a Uniform Law on the Form of an International Will, was concluded in the context of UNIDROIT. The Convention provided for a universally recognised code of rules under which a will made anywhere, by any person of any nationality, would be valid and enforceable in every country which became a party to the Convention. These are known as "international wills". Belgium, Bosnia-Herzegovina, Canada (for 9 provinces, not Quebec), Cyprus, Ecuador, France, Italy, Libya, Niger, Portugal Slovenia, The Holy See, Iran, Laos, the Russian Federation, Sierra Leone, the United Kingdom, and the United States have signed but not ratified. International wills are only valid where the convention applies. Although the US has not ratified on behalf of any state, the Uniform law has been enacted in 23 states and the District of Columbia. For individuals who own assets in multiple countries and at least one of those countries are not a part of the Convention, it may be appropriate for the person to have multiple wills, one for each country. In some nations, multiple wills may be useful to reduce or avoid taxes upon the estate and its assets. Care must be taken to avoid accidental revocation of prior wills, conflicts between the wills, to anticipate jurisdictional and choice of law issues that may arise during probate. Intentional physical destruction of a will by the testator will revoke it, through deliberately burning or tearing the physical document itself, or by striking out the signature. In most jurisdictions, partial revocation is allowed if only part of the text or a particular provision is crossed out. Other jurisdictions will either ignore the attempt or hold that the entire will was actually revoked. A testator may also be able to revoke by the physical act of another (as would be necessary if he or she is physically incapacitated), if this is done in their presence and in the presence of witnesses. Some jurisdictions may presume that a will has been destroyed if it had been last seen in the possession of the testator but is found mutilated or cannot be found after their death. A will may also be revoked by the execution of a new will. However, most wills contain stock language that expressly revokes any wills that came before them, because otherwise a court will normally still attempt to read the wills together to the extent they are consistent. In some jurisdictions, the complete revocation of a will automatically revives the next-most recent will, while others hold that revocation leaves the testator with no will, so that their heirs will instead inherit by intestate succession. In England and Wales, marriage will automatically revoke a will, for it is presumed that upon marriage a testator will want to review the will. A statement in a will that it is made in contemplation of forthcoming marriage to a named person will override this. Divorce, conversely, will not revoke a will, but in many jurisdictions will have the effect that the former spouse is treated as if they had died before the testator and so will not benefit. Many jurisdictions exercise an equitable doctrine known as "dependent relative revocation" ("DRR"). Under this doctrine, courts may disregard a revocation that was based on a mistake of law on the part of the testator as to the effect of the revocation. For example, if a testator mistakenly believes that an earlier will can be revived by the revocation of a later will, the court will ignore the later revocation if the later will comes closer to fulfilling the testator's intent than not having a will at all. The doctrine also applies when a testator executes a second, or new will and revokes their old will under the (mistaken) belief that the new will would be valid. However, if for some reason the new will is not valid, a court may apply the doctrine to reinstate and probate the old will, if the court holds that the testator would prefer the old will to intestate succession. Before applying the doctrine, courts may require (with rare exceptions) that there have been an alternative plan of disposition of the property. That is, after revoking the prior will, the testator could have made an alternative plan of disposition. Such a plan would show that the testator intended the revocation to result in the property going elsewhere, rather than just being a revoked disposition. Secondly, courts require either that the testator have recited their mistake in the terms of the revoking instrument, or that the mistake be established by clear and convincing evidence. For example, when the testator made the original revocation, he must have erroneously noted that he was revoking the gift "because the intended recipient has died" or "because I will enact a new will tomorrow". Also referred to as "electing to take against the will". In the United States, many states have probate statutes which permit the surviving spouse of the decedent to choose to receive a particular share of deceased spouse's estate in lieu of receiving the specified share left to him or her under the deceased spouse's will. As a simple example, under Iowa law (see Code of Iowa Section 633.238 (2005)), the deceased spouse leaves a will which expressly devises the marital home to someone other than the surviving spouse. The surviving spouse may elect, contrary to the intent of the will, to live in the home for the remainder of his/her lifetime. This is called a "life estate" and terminates immediately upon the surviving spouse's death. In New York, a surviving spouse is entitled to one-third of her deceased spouse's estate. The decedent's debts, administrative expenses and reasonable funeral expenses are paid prior to the calculation of the spousal elective share. The elective share is calculated through the "net estate". The net estate is inclusive of property that passed by the laws of intestacy, testamentary property, and testamentary substitutes, as enumerated in EPTL 5-1.1-A. New York's classification of testamentary substitutes that are included in the net estate make it challenging for a deceased spouse to disinherit their surviving spouse. In antiquity, Julius Caesar's will, which named his grand-nephew Octavian as his adopted son and heir, funded and legitimized Octavian's rise to political power in the late Republic; it provided him the resources necessary to win the civil wars against the "Liberators" and Antony and to establish the Roman Empire under the name Augustus. Antony's officiating at the public reading of the will led to a riot and moved public opinion against Caesar's assassins. Octavian's illegal publication of Antony's sealed will was an important factor in removing his support within Rome, as it described his wish to be buried in Alexandria beside the Egyptian queen Cleopatra. The longest known legal will is that of Englishwoman Frederica Evelyn Stilwell Cook. Probated in 1925, it was 1,066 pages, and had to be bound in four volumes; her estate was worth $100,000. 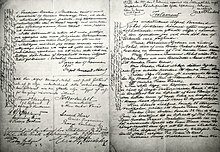 The shortest known legal wills are those of Bimla Rishi of Delhi, India ("all to son") and Karl Tausch of Hesse, Germany, ("all to wife") both containing only two words in the language they were written in (Hindi and Czech, respectively). The shortest will is of Shripad Krishnarao Vaidya of Nagpur, Maharashtra, consisting of five letters (“HEIR'S”). In case I die in this mess I leave all to the wife. Cecil Geo. Harris. The fender was probated and stood as his will. The fender is currently on display at the law library of the University of Saskatchewan College of Law. After the testator has died, an application for probate may be made in a court with probate jurisdiction to determine the validity of the will or wills that the testator may have created, i.e., which will satisfy the legal requirements, and to appoint an executor. In most cases, during probate, at least one witness is called upon to testify or sign a "proof of witness" affidavit. In some jurisdictions, however, statutes may provide requirements for a "self-proving" will (must be met during the execution of the will), in which case witness testimony may be forgone during probate. Often there is a time limit, usually 30 days, within which a will must be admitted to probate. In some jurisdictions, only an original will may be admitted to probate—even the most accurate photocopy will not suffice. Some jurisdictions will admit a copy of a will if the original was lost or accidentally destroyed and the validity of the copy can be proved to the satisfaction of the court. ^ Freedman, Adam (2013). The party of the first part the curious world of legalese. New York: Henry Holt and Company. ISBN 1466822570. ^ Eugene F. Scoles, Problems and Materials on Decedents' Estates and Trusts (2000), p. 39. ^ Chuck Stewart, Homosexuality and the Law: A Dictionary (2001), p. 310. ^ See also, for example, In Re Kaufmann's Will, 20 A.D.2d 464, 247 N.Y.S.2d 664 (1964), aff'd, 15 N.Y.2d 825, 257 N.Y.S.2d 941, 205 N.E.2d 864 (1965). ^ For example, if the child attempted to kill the parent. ^ User, Super. "Convention providing a Uniform Law on the Form of an International Will (Washington, D.C., 1973)". www.unidroit.org. ^ a b Eskin, Vicki; Driscoll, Bryan. "Estate Planning with Foreign Property". American BAR Association. Retrieved 18 June 2014. ^ a b Fry, Barry (2012). "Cross Border Estate Issues" (PDF). Advoc. Retrieved 7 June 2017. ^ Popovic-Montag, Suzana; Hull, Ian M. (2 Oct 2015). "The Risks and Rewards of Multiple Wills". HuffPost Canada Business. Retrieved 7 June 2017. ^ "NRS: CHAPTER 136 - PROBATE OF WILLS AND PETITIONS FOR LETTERS". www.leg.state.nv.us.